Aspire Z3 Series all-in-one PCs pack sharper visuals and fuller audio into stylish, space-saving packages that fit both your home dÃ©cor and budget. Movies, TV shows, video clips on video-sharing sites, you name it, theyâ€™ll all1 look better on their Full HD (1920 x 1080) displays. They are equipped with stereo speakers tuned with Acer TrueHarmony technology and DolbyÂ® Digital Plus Home Theaterâ„¢, so everything will sound great and lifelike. 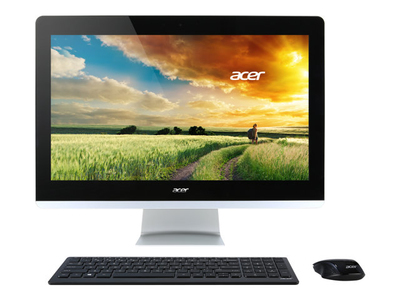 Aspire Z3 Series PCs feature adjustable displays that can tilt from -5Â° to 30Â°2. Also with Acer BluelightShieldâ„¢, they can filter out eye-straining blue light. Enjoy clear web chats with family and friends via their Full HD webcams and digital microphones. With 35 mm2 housings that are as thin as a pizza box, they wonâ€™t take up a lot of space. Plus, they look stylish and blend in seamlessly with the dÃ©cor of any modern home. Yet despite their stylishly slim form-factors, theyâ€™re still able to sport DVD Super Multi drives. Aspire Z3 Series PCs give you up to 2 TB of storage and feature easy to access side facing ports, including USB 3.0, for hassle-free connections to external multimedia sources and peripherals.